One of my other hobbies is bird watching, and one of the members of a bird-watching list I belong to lives in Alaska. I guess bald eagles are as common to her as pigeons are to me! But she has taken some great photos, and I loved one so much I asked her if I could do a pastel of it. She graciously agreed and this is the result. I took a little artistic license here - moving the eagle a bit so he's flying into the picture rather than out of it, and making him a mature bald eagle rather than a juvenile. This is beautiful! 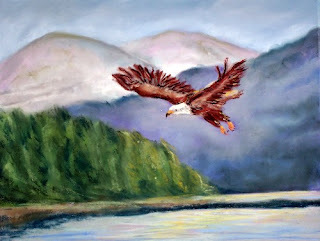 I have been enjoying your paintings, finished or not, but this one really captures the spirit of a truly wild creature.